The classic commemorative series consists of fifty different designs, but a complete set includes 144 coins, thanks in part to the two final issues which each saw multi-year releases. The first, the Booker T. Washington Commemorative half dollar, or “BTW half” as it is commonly known, will be discussed in this article. The next installment in this series will discuss the final silver classic commemorative, the Washington-Carver half dollar. Both issues are in part dedicated to Booker T. Washington, the educator who became the most influential African American of the late 19th and early 20th centuries. Born on April 5th, 1856, Booker Taliaferro Washington was the son of a slave named Jane and an unnamed white father, presumably a plantation-owner. Following the Emancipation Proclamation and the end of the Civil War, his family moved to West Virginia when he was nine years old. His mother had married another slave named Washington Ferguson and the young boy decided to take Fergeson’s first name as his last name when starting school in West Virginia. His studies were completed at the Hampton Institute and at Wayland Seminary in the nation’s capital. Following the completion of his schooling, Washington was recommended by the President of the Hampton Institute to become the first leader of the Tuskegee Normal and Industrial Institute in Alabama, a position that he would hold the rest of his life. That life was dedicated to the fight against racial segregation in the American South. Washington grew to become a leading figure in the movement, and in 1901 would become the first African American to be invited to the White House to dine with the President, Theodore Roosevelt. Washington traveled extensively for the cause, while still holding his position at Tuskegee, publishing books and papers, and giving spirited speeches around the country. 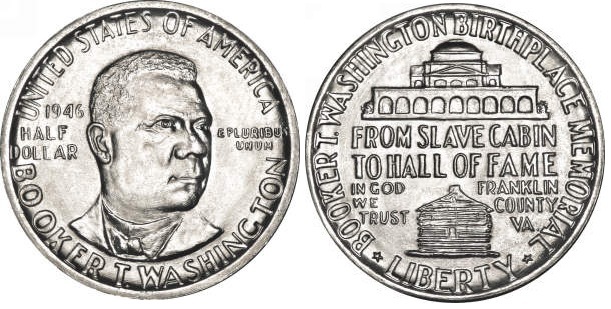 The Act of August 7, 1946, authorized a commemorative coin to honor Booker T. Washington and his life. This was the same Act that had authorized the Iowa commemorative. The difference was that only one half dollar issue would be struck to celebrate Iowa’s centennial, while the Booker T. Washington act stated a maximum mintage of 5 million coins that could be struck for five years beginning in 1946. This situation seemed eerily familiar to the early commemorative programs, often abused to benefit the pockets of the organizers. The result is that there were eventually a total of eighteen different BTW commemoratives, with net mintages (after melting left-over pieces) ranging from 500,000 to 6,000 pieces. The coins were initially issued by the Booker T. Washington Birthplace Memorial Commission, with proceeds going to “perpetuate the ideals and teachings of Booker T. Washington,” and to raise money for memorials dedicated to him. The coins were to supposed be designed by Charles Keck, but when Isaac Scott Hathaway offered to design the coin free of charge, the switch was easily made. Hathaway was an African-American artist from Kentucky who would also design the Washington-Carter Commemorative a few years later. He was the founder of the Ceramics Department at Tuskegee Institute and would become the first African American to design an American coin. The obverse of Hathaway’s designs shows a three-quarters view of Booker T. Washington. Above him is UNITED STATES OF AMERICA and below the bust is his name, BOOKER T. WASHINGTON. In the right field is the motto E PLURIBIUS UNUM, while in the left field behind his ear is the year of issue. The reverse shows two buildings at the center, with the Hall of Fame for Great Americans (located in the Bronx and now part of Bronx Community College) at the top and the slave cabin where Washington was born near the bottom. Between the two buildings are the words FROM SLAVE CABIN TO HALL OF FAME, IN GOD WE TRUST, and FRANKLIN COUNTY VA. 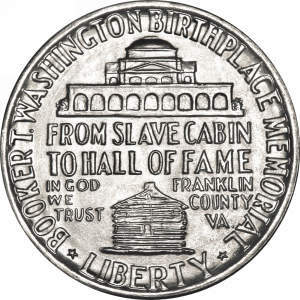 The word LIBERTY is directly below the slave cabin, while BOOKER T. WASHINGTON BIRTHPLACE MEMORIAL surrounds the rest of the design. Coins struck at the Philadelphia Mint do not carry a mint mark; those struck at the Denver or San Francisco Mints carry a small “D” or “S” between the word LIBERTY and the cabin. 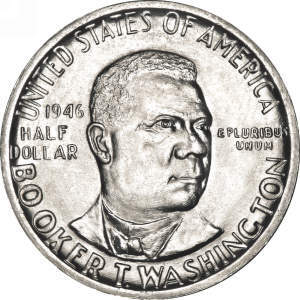 Production of the first Booker T. Washington half dollars commenced at all three mints in December of 1946. The Philadelphia Mint struck 1,000,000 pieces, the Denver mint produced 200,000 coins, and San Francisco struck 500,000 coins. The Philadelphia issue was sold for $1 each, while both the Denver and San Francisco issues sold for $1.50. Sales were good but not as good as expected, and half of the Philadelphia mintage was later melted, as was half of the Denver mintage and 180,000 of the San Francisco issue. This would continue during the following years, when additional Booker T. Washington commemoratives were struck. From 1947 to 1951, all three mints struck Booker T. Washington commemoratives. Mintages plummeted, however, especially if you take into consideration the number of pieces melted at a later date. Net mintages for 1947 totaled approximately 10,000 coins from each mint. For 1948 it was 8,000 each and in 1949 it was 6,000. The Philadelphia and Denver issues of 1950 also saw a net mintage of 6,000 coins, but the San Francisco mint saw a much larger production, with a net mintage of 277,000 coins. These were supposedly sold for $1 each to fund construction of schools and hospitals, although none ever appear to have been built from the proceeds. The 1951 Philadelphia issue also saw a large net mintage of approximately 280,000 coins, struck for no apparent reason. The Denver and San Francisco issues of that year saw much more realistic mintages of 7,000 coins each. Some of these later issues were distributed by Stack’s of New York City or Bebee’s of Omaha. Issue prices also fluctuated over the years, although most were only offered in sets of three (the large mintage coins and the early issues being exceptions). 1947 sets were $6.00 a piece, 1948 sets were $7.50, and the 1949, 1950, and 1951 sets were sold for $8.50 per set of three. To this was added a 30-cent charge for postage and handling. No Booker T. Washington commemorative half dollars can be considered rare, and the type is considered the easiest classic commemorative to acquire in virtually all grades up to MS-65. The low-mintage sets can be something of a challenge if you’re looking for intact original sets, but virtually all those coins have been saved individually, and despite the low mintage can be easily acquired. The 1947 issues are priced the highest at the MS-66 level, as the populations are considerably less than some of the other dates in the series. MS-67 graded examples are rare to very rare for all dates, including the “common” high mintage issues.